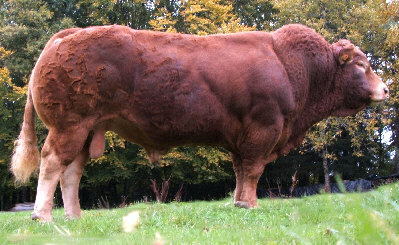 Bahut is an extremely wide, heavily muscled bull with great legs, locomotion and breed character. He displays excellent temperament which he passes on (download Igenity DNA analysis for high docility score) and positive calving ease. Bahut the 2010 Espoir Champion at the French National Show & Muscle Champion at the Brive Show. We are quite excited by this bull as feedback from France and UK is extremely positive particularly for females, which is a terrific combination with the obvious heavy muscling that the bull dispalys. To put the Igenity docility result for Bahut into perspective, the highest Australian used AI sires that we can find results for have an Igenity docility score of +7. These bulls are Romn Justice (EBV +62), TMF Harmonica (EBV +46) and Romn Tuff Enuff (EBV +29) and have an average docility EBV of +45.7. When compared with Bahut's +9 Igenity docility score you can see that Bahut stacks up pretty well.